Here are the only two Pepes in the entire history of major league baseball, poised on the brink of their team’s putrid 1976 season. 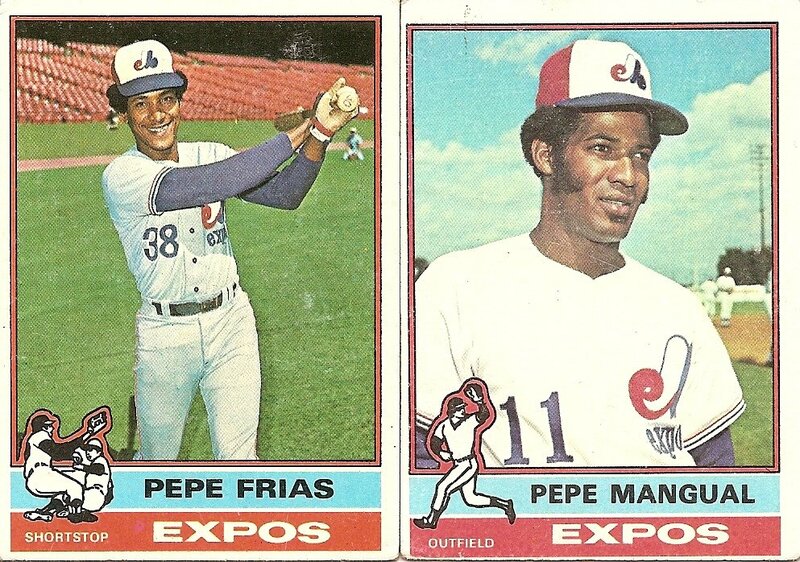 The Era of the Two Pepes had begun in 1973, when 24-year-old Frias made a major league roster that already included 20-year-old Mangual, who’d broken baseball’s Pepe line by playing a few games the previous September. The versatile Frias, who could fill in for regulars at three infield positions and who (along with Otis Nixon) will be in the record books until the sun explodes as the most-used pinch-runner in Expos history (despite the apparent lack of speed suggested by his mere 12 career stolen bases), got into more games during the first two of the two-Pepe seasons, but then in 1975 Mangual took the lead in Pepe appearances by becoming the Expos’ everyday leadoff hitter. Mangual’s status as the top Pepe continued in 1976, but this seemed not to be a recipe for success as the Expos swiftly plummeted from longtime middle of the pack also-rans to a borderline entry into the discussion of the worst teams of all time. By the end of the 1976 season the Expos had dropped 107 games. Worse, all the losing spurred the increasingly desperate Expos to trade Pepe Mangual in midseason to the Mets, thus banishing the short brittle epoch of the Pepes to the dustheap of history. Yes, someday the sun will explode. I mean, right? I’m actually not too clear about all that, but certainly there’s got to be some kind of finite cosmic end date on our lease at this location. We’ll blow ourselves up, or drown in the rising ocean, or poison all our food, or get hit by a meteor, or sucked into a black hole, or else cockroaches will finally get sick of waiting around for us to hand over the keys, or the sun will burst or fizzle out or whatever it does when it gets tired of shining. So what’s this all about then? I mean, why are people rushing for the downtown number 6 train or getting haircuts or writing prose poems or keeping records for most times used as a pinch runner? At a certain point all of this will be completely erased from any kind of human consciousness, unless we build some kind of spaceship so sturdy that it can endure not only the annihilation of our neck of the woods but also the eventual collapse of the whole universe back into itself. And though I know there are some smart people among us, I sort of doubt this can happen. So the question remains, what to do with the time we do have here, this life of ours that is so rare it makes the appearance on a single team at the same time of the only two Pepes ever to play major league baseball seem no more unusual than a dandelion popping up at the edge of a suburban lawn. The fact that we’re alive is a miracle far beyond the far-fetched tale of the two Pepes. There’s no life anywhere else as far as anyone else has been able to see, just this one blue marble in the endless black. We’re the only ones breathing. It’s too much, really. I can’t really fathom it. I have to go watch some television. But first, just a few more words about the Pepes. The Pepes did not appear together in the Expos starting lineup with much regularity, but on one of the last occasions when the Expos went to battle with a two-Pepe attack (just a little over a week before the Mangual trade, perhaps not coincidentally), Larry Dierker of the Astros hung a no-hitter on the Canadian squad. The Expos had nearly been no-hit a month earlier, but Pepe Mangual broke up Andy Messersith’s bid with a one-out ninth-inning single. Three years later, Pepe Frias, no longer an Expo, was among the contributors to a hitless effort by the hapless Atlanta Braves against Ken Forsch. In that game he was pinch-hit for by cup-of-coffee pro Bob Beall, who would finish the season batting .133. In the earlier no-hitter Frias had been replaced at the plate late in the game by none other than Tim Foli, which is like having been bumped as a keynote speaker at the 1994 Conference for Clearly Enunciated Optimism in favor of Kurt Cobain. You are currently browsing the archives for the Pepe Mangual category.